UniqueValentineGift.com presents the Key to My Heart Love Box. 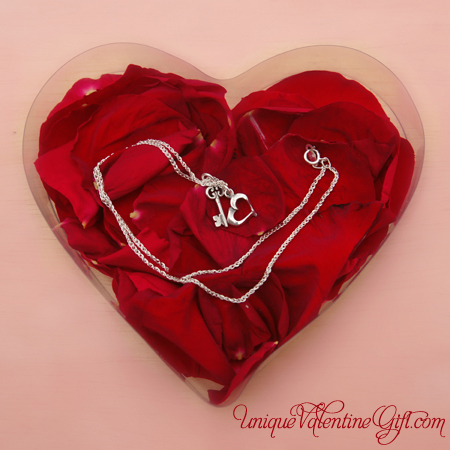 Cupid is proud of his latest creation: sterling silver jewelry combined with fresh rose petals placed inside a heart shaped box. Nothing compares to the ethereal scent of fresh rose petals, and when they're combined the result is a unique gift she'll never forget. The two exquisite pieces of sterling silver jewelry are charm-like and come on a sixteen inch sterling chain. One is a sculpted heart; the other an old-fashioned skeleton key, and both are original designs created using the "lost wax" method of casting jewelry, a once popular but now rare method of jewelry fabrication. This Valentine's day, be remembered as totally Unique!